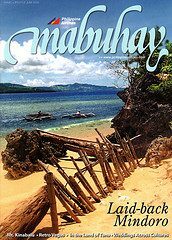 Now on board Philippine Airlines flights is the June 2009 issue of Mabuhay magazine, PAL’s Inflight Magazine. It was a pleasant surprise when I got a copy of the issue as the cover story entitled “Secrets of Mindoro” was my photography and writing assignment work for them on one of their destinations, San Jose, Mindoro. Too bad I didn’t get the cover for this one (cover by Jerome Bonto) but I’m still glad it got the main feature on this issue as I was expecting only to be one of the inside features. Also in this issue I got two more photos for Kota Kinabalu with writer John Oates. Checkout the editorial note and contributor’s feature to know more about the issue.